A Survey of Exonym Use. Tagungsband von Peter Jordan, Irena Švehlová & Paul Woodman (eds. ), Verlag Dr. Kovač 2018, 198 S.
The Working Group (WG) on Exonyms of the United Nations Group of Experts on Geographical Names was established in 2002. 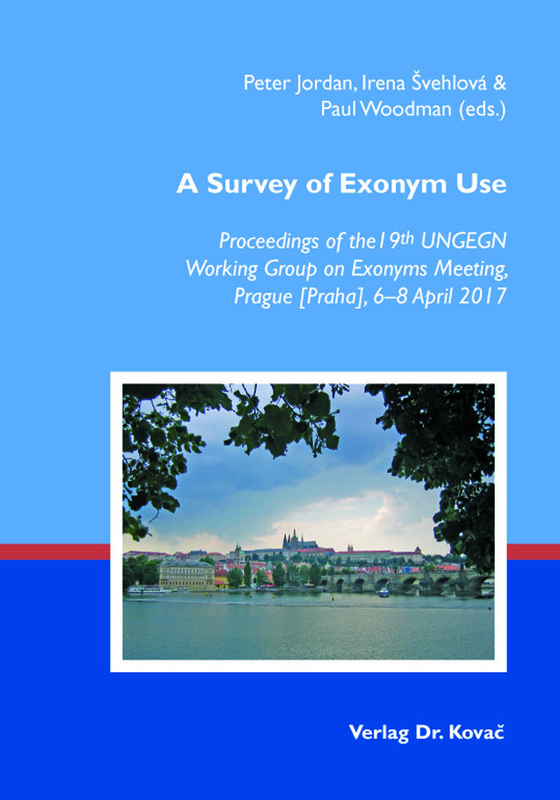 The papers in this volume of Name & Place, marking the 19th Meeting of the WG in Prague in 2017, represent a cross-section of the knowledge acquired after 15 years of collective activities, in which the WG has developed – and hopefully enhanced – its understanding and appreciation of the subject of exonyms with the sub-themes usage, standardization, definitions, and criteria. All of them have been examined in this book series. In this volume we return to the subject of exonym usage, through papers which reveal a survey of the circumstances under which exonyms are deployed in individual countries today. Sie wollen Ihren Tagungsband drucken?